Identification, protection and preservation of cultural and natural heritage around the world are the prime objectives of The United Nations Educational, Scientific and Cultural Organization (UNESCO). This is embodied in an international treaty called the "Convention concerning the Protection of the World Cultural and Natural Heritage" , which was adopted by UNESCO in 1972. The concept of World Heritage has a universal application. World Heritage sites belong to all people of the world, irrespective of the territory or place , where they are located. Among the 1073 properties in the World heritage list, 832 sites are categorised to Cultural Site, 206 sites are categorised to Natural Site and the remaining 35 are grouped under Mixed Site. This list is designed to inform about the conditions that threaten the properties of the heritage site, which was inscribed on the World heritage sites list and to prompt for corrective action of the corresponding site. 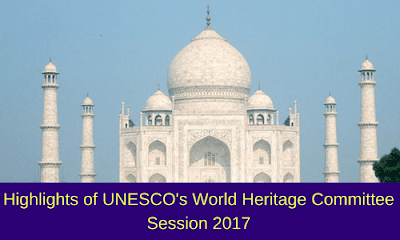 Inscribing a site on the 'List of World Heritage in Danger' allows the World Heritage Committee to allocate immediate assistance from the 'World Heritage Fund' to the endangered site. There are 36 properties in the World Heritage list from India. 28 sites belong to Cultural category, 7 sites belong to Natural category and 1 site belongs to Mixed category. They are listed as follows.The year in the bracket is the year in which the sites were inscribed in the list.